I am not an artist; the closest I come is through photography. 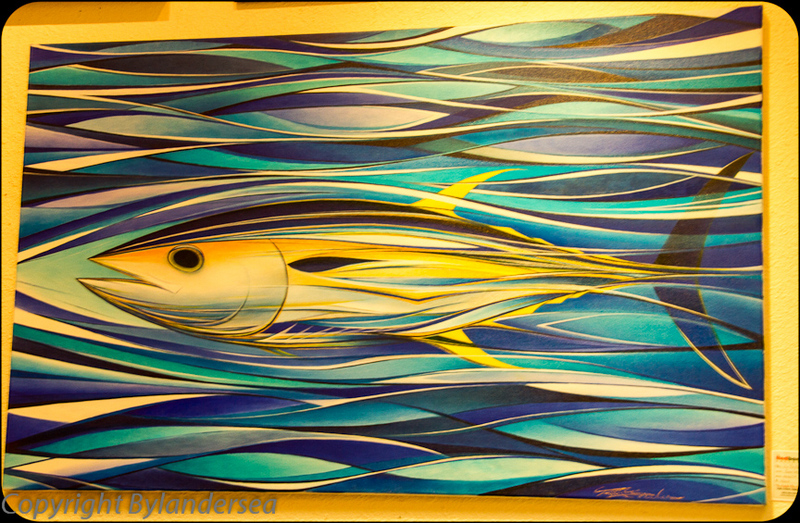 However, I recently found myself in Key Largo and was offered a painting class with Pasta. Hmm. My thoughts ran to my grandkids and those colorful necklaces and bracelets they make with painted pasta shapes. No noodles here. I entered a fabulous artist’s studio and gallery where I met Roberto Pantaleo, a.k.a. Pasta, my instructor. 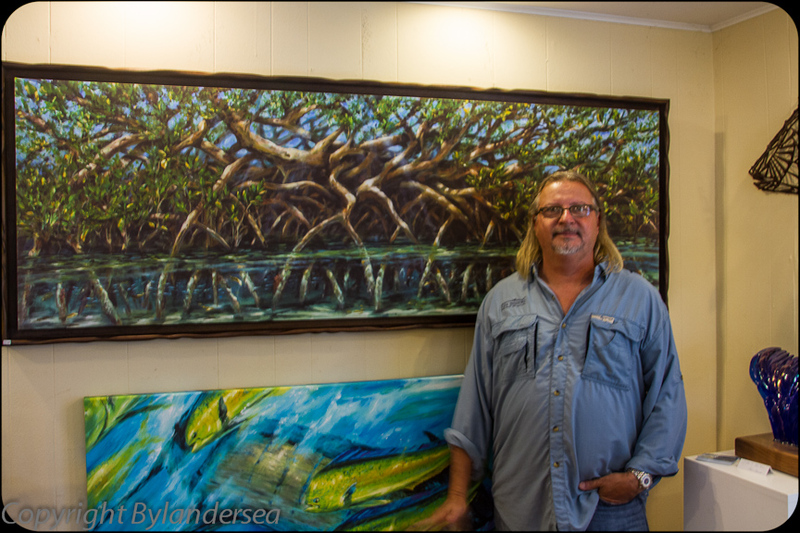 Pasta is an artist who paints vibrant scenes of the Keys, mostly fish and marine life. I adored his lines and design in the above fish and was drawn to the peacefulness of this mangrove tree with criss-crossed roots. 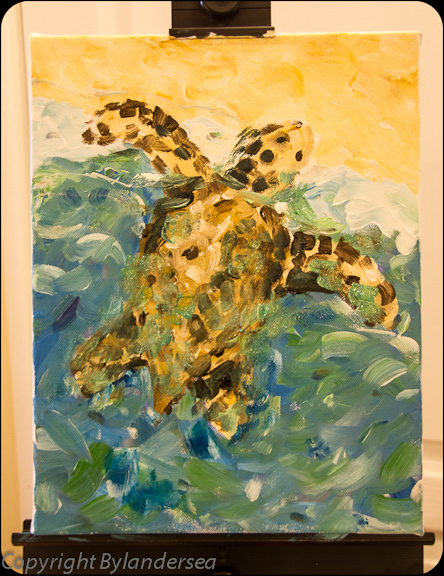 I was to paint a Leatherback turtle–okay! First, I sketched oval egg shapes on a piece of paper and Pasta showed me how to blend those into the turtle’s head, body and limbs. Next, I drew a similar animal on canvas. So far so good. Now it was time to pick up the brush- a daunting task. “Just mix blue and green together and drab them onto the canvas like Monet,” said Pasta. Sure, I thought. Amazingly, my little turtle was coming to life better than I expected and the thing was — I was having a blast. I forgot about time and felt like I was floating in the water with my tortoise. I was literally living in the moment. 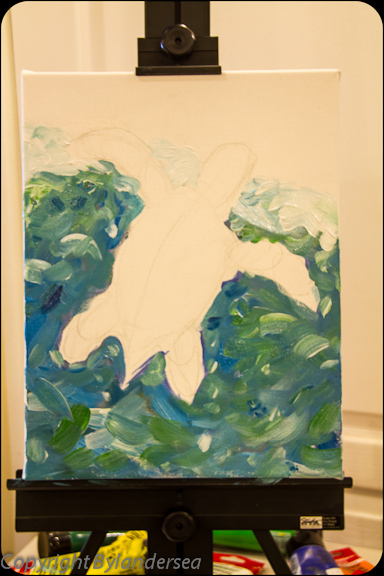 When I tried painting my turtle’s shell, my efforts didn’t achieve much depth. But, a few strokes from the master greatly helped the cause. I ended up with a painting I’m rather proud of. Sure, I know it’s a primitive work but I had fun. Wish I could take another class. Pasta Pantaleo is the ideal teacher; he’s encouraging and helpful, never demeaning and an all-around happy person. Might be the island’s aura, but the Keys seem to bring out art in everyone.